Cuerva Bakeshop Greenhills Branch Gets a Warm Welcome! It has been a few months since we first opened our doors at our Greenhills Branch on December 8, 2018. We are grateful for the warm welcome our new neighbors have greeted us with! Even before we opened shop, customers would message us or even drop by to see if we were open! Come by for a slice of cake and a cup of coffee real soon! We’d like to welcome you too! Cuerva Bakeshop featured on honestbee's Christmas Boutique til Dec 31, 2018! PDI Best Desserts ties up with concierge and delivery app, honestbee, to offer a curated Christmas Boutique for the 2018 Holiday season. 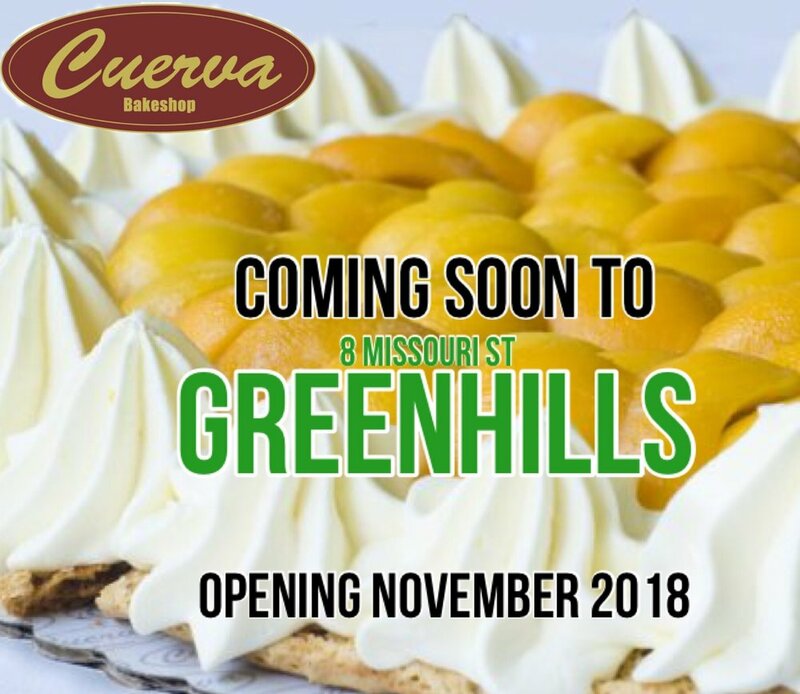 Included in the lineup are Cuerva Bakeshop’s award-winning desserts and classics. Download the app and have your favorite desserts delivered to your door in 5 easy steps: 1. Open app, 2. Choose Groceries, 3. Scroll Down to PDI Desserts, 4. Choose Cuerva Bakeshop 5. Add items to cart and checkout! We are opening a new location in time for the 2018 Holiday Season! At long last, we are opening our doors in the North! We look forward to our being a little bit closer to our loyal customers who live and work in the area! Inquirer Lifestyle's Best Desserts 4 Book Launch event last May 28,2018 at SMX Aura had an endless stream of delectable cakes and pastries with their creators proudly sharing them with the crowd. Included in the best of the best, two of Cuerva Bakeshop's desserts were awarded: our Strawberry Dream Cake and our Cheesecake Fudge. On stage for the awarding were the book's author, Vangie Baga-Reyes, Inquirer president and CEO, Sandy Prieto-Romualdez, and host, Sea Princess (in a colorful dessert-inspired outfit). If you weren't able to walk through the amazing displays and taste all the samples at the even, don't worry... you can get your own copy of Best Desserts 4 and experience the magic! Turning up the HEAT at EDSA Shangri-La's Sunday Lunch Buffet! Enjoy amazing culinary creations by the Chefs at Heat Restaurant EDSA Shangri-La every Sunday. On feature are local companies such as Cuerva Bakeshop's Mango Torte and Honey Cake. We are delighted to be presented on the pastry buffet table along side other mouth-watering desserts! Bring your appetite! GMA TV News Feature on "Home Base"
To help you plan for your holiday and special events, Home Base television show on GMA TV put together a New Years episode featuring selected vendors with unique ideas. We were fortunate enough to be included with a great segment showcasing our products and sharing a little bit of our company's history. Feature: Manila Bulletin Lifestyle "best desserts of the season"
Last December, Manila Bulletin Lifestyle featured Cuerva Bakeshop's Mango Torte in the "best takeaways and desserts of the season". We believe our desserts are delectable all year-round, and not just for Noche Buena! Check out the mouth-watering video of delicious dishes and desserts that we shared the feast table with. From the article of contributing writer Angelo G. Garcia. Come spend the day or a few hours at the American Women's Bazaar at SMX Convention Center, MOA, once a month (usually first Tuesday) from 8:30am til 3:00pm. Hundreds of great vendors featuring local handicraft, export items, clothing and accessories as well as home furnishings have gathered to showcase their wares. Gourmet food items, delicacies and ethnic dishes will satisfy all your cravings. Stop and enjoy a delicious lunch or snack and then take home your favorites. This is the only place we sell our mango torte by the slice! After all that shopping, its a well-deserved treat. Best of all, your Php100 entrance fee will help fund local charities supported by the American Women's Club. This month's feature is the Spanish Chocolate Cake, a chocolate lover's dream of decadent cake layers a slow-cooked Spanish chocolate icing and chopped walnuts. Our founder, Paz, created this cake that is truly "un favorito de la familia"